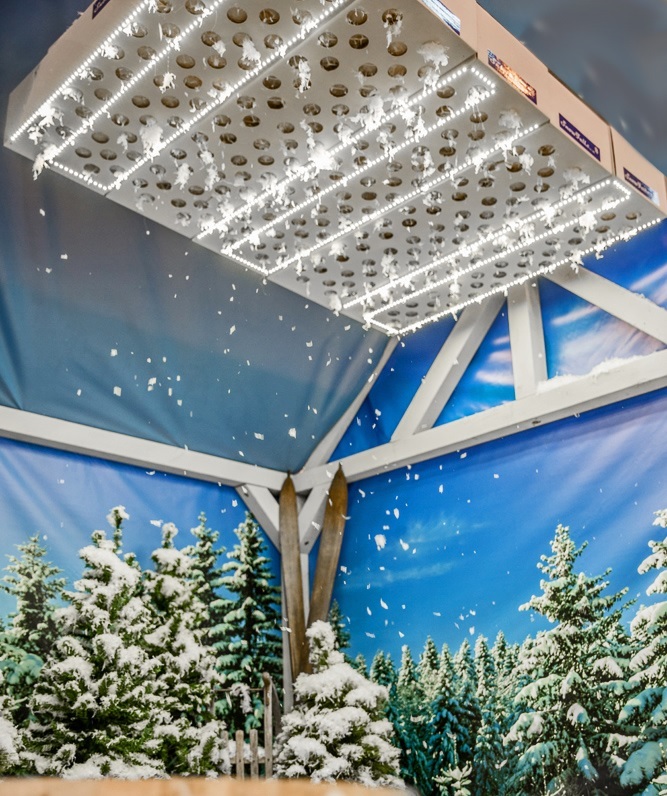 Wonderfall XL creates 8 hour snow effects for floor and window displays, theatrical stage, Christmas trees, dance floors or just about anywhere indoors. Wonderfall XL will dispense and easily drop all flower petal confetti and snow products you see on this website and more! The snowfall is a gentle falling effect. Our snow material falls steady and evenly, and square confetti, fall leaves, or flower petals more of a random fall. Wonderfall XL comes with hardware, with metal hanging rings built-in to each corner of the machine so it can be hung easily and in the most challenging areas. One unit is recommended for every 4 to 5 feet of display or stage area. Different snow and confetti can be used in the same machine. It weighs just 3 pounds empty and holds 3 pounds of snow so it’s very easy to handle and install. Typically, it takes about 5 min. to refill a Wonderfall XL machine.